Fairborn’s Shaunn Monroe (3) drives around a wall of Trotwood-Madison defenders in the first half of Tuesday’s Jan. 29 game at the Baker Memorial Fieldhouse. Tylen Eatmon (2) of Fairborn puts a shot onto the glass as Trotwood-Madison’s Daylon Morgan (13) takes a swipe at the ball, Jan. 28, in first-half action at Baker Middle School in Fairborn. O.J. Person dribbles out of a possible trap by Malachi Mathews and Carter Mims of Trotwood-Madison, in the second half of Tuesday’s boys high school basketball game in Fairborn. FAIRBORN — Facing the bullies of the Greater Western Ohio Conference’s South division, the Division II No. 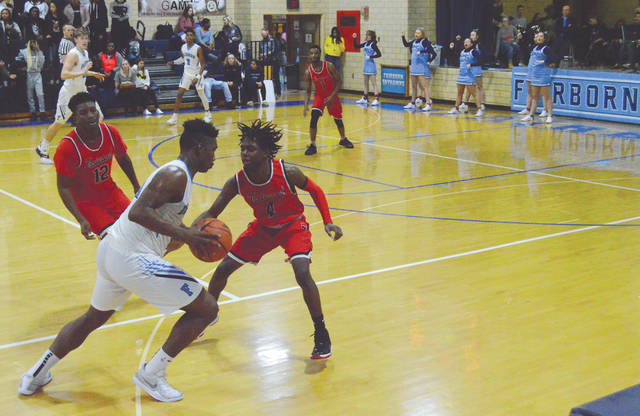 1-ranked Trotwood-Madison Rams, the Fairborn High School boys varsity team gave it their all Jan. 29 in front of a rowdy crowd at the Baker Memorial Fieldhouse. Trotwood-Madison may not have scored its usual 100-plus points, but the Rams showed they have plenty of defense of their own to get the job done. T-M opened up a 49-36 halftime lead, then withstood a Fairborn flurry late, to claim an 88-74 win. The Rams are now averaging 99.7 points per game, while holding opponents to 67.7. They’re averaging 106.7 points per contest against GWOC South opponents. 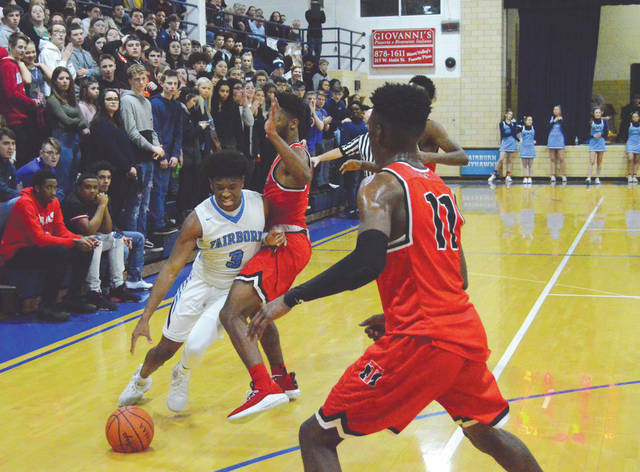 Fairborn kept them well below those scoring averages, while scoring more than their average defensive limit, but too many turnovers against the Rams’ defensive full-court press seemed to be the difference. Unofficially, Fairborn coughed up 19 turnovers to 12 for Trotwood. “I thought our kids played hard tonight. They came in and battled,” Fairborn coach Billy Harchick said. “We’re trying to build to where we’re not just satisfied with the effort, but to where we get the actual result we want too. 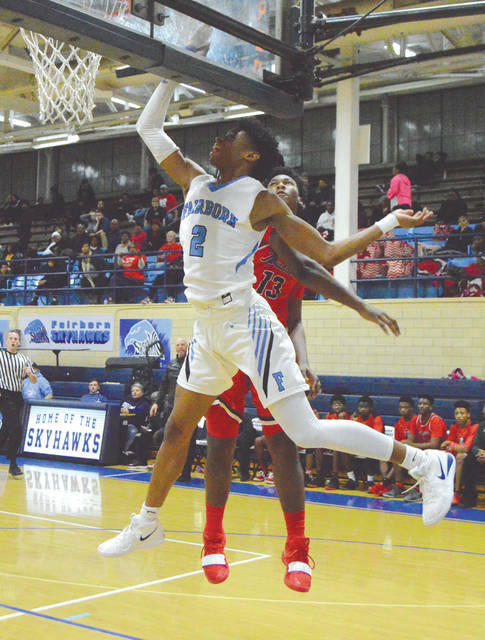 The Rams led by 18 heading into the final quarter of play, and scores by Shaunn Monroe, Tylen Eatmon and pulled the Skyhawks to within 13 points (74-61) with 6:27 to go, but Trotwood wouldn’t let Fairborn get any closer. Monroe finished with a team-high 24 points, with 20 of that total coming in the second half. Tylen Eatmon scored 17 points and O.J. Person finished with nine. Fairborn now finds itself a game and a half behind the Rams in the GWOC South standings. The Skyhawks are now 11-5 overall, and 8-2 in the division. Amari Davis, the Greater Western Ohio Conference’s second-leading scorer behind Xenia’s Samari Curtis, finished with 27 points for Trotwood. Carl Blanton finished with 14 points and Keontae Huguely added 13 to up the Rams record to 13-2 overall, 9-0 in the GWOC South. Despite the win, T-M coach Rocky Rockhold wasn’t entirely happy with the way his team played against Fairborn. “You know it was a game of runs. We made some scoring runs early, and we were really good defensively for awhile, then we didn’t play very well for awhile,”Rockhold said. “I think once it got late, we kind of got into an up-n-down game where we were just trading baskets with them. We didn’t take good care of the ball very well at all. I haven’t seen the numbers, but I feel like we turned it over a lot. Due to a canceled game earlier this season due to the weather, the two GWOC South leaders will see each other again on Saturday, Feb. 2 on Trotwood’s home floor. That game is set for a 7:30 p.m. start. Before that, however, Fairborn has a 7:30 p.m. GWOC South date on Friday, Feb. 1 in Riverside against Stebbins, while T-M plays host that same night to division foe West Carrollton.